Dairy Technology is an engineering field that deals with the processing of milk and its products. This field involves the use of “Technology” to make the dairy products and processing more advanced, hi-tech and useful. The dairy technology is a component of food technology that specifically deals with the processing, storage, packaging, distribution and transportation of the dairy products like milk, ice-cream, curd etc by implying the science of biochemistry, bacteriology, nutrition to the milk and milk products. Get Latest Career Notification about Dairy Technology, by entering your details below. A person who works to process milk and its products in order to remove harmful toxins without affecting the nutritional value is termed as “Dairy Technologist”. The dairy technology is one of the emerging career fields of engineering which generally deals with the overall production and processing of milk and milk based products. The students who are interested in the dairy science and wants to make their career in this field, then they can pursue a course in dairy technology ranging from diploma to postgraduate degree/PhD. Which courses will be beneficial in the field of Dairy Technology? “After pursuing master courses in this field you can also go for the Ph.D course (Doctor of Philosophy in Dairy Chemistry)”. These course imparts skills in the application of chemical, biological, physical & engineering science in processing of milk products. It offers the knowledge and skills which are required in the field of Dairy Technology. 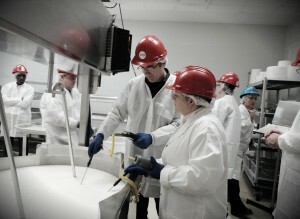 It educate about the engineering concepts being made use in dairy manufacturing procedures. What will be the eligibility criteria for these courses? The students, who are interested in this field, must pass class 12th examination with minimum 50% in physics, chemistry and Mathematics. The admission to the undergraduate and postgraduate courses is based on the all India entrance examination conducted by ICAR, New Delhi. The eligibility criteria for the admission to the PG courses in Dairy Technology is based on the B.E/B.Tech degree in a specified discipline, followed by interview. The duration of this course will be two years. How to get admission in Dairy Technology Courses? You can apply for admission in B.Tech-Dairy Technology courses on the basis of merit list released by various colleges. The merit list is prepared on the basis of qualifying exam or entrance tests (as applicable). “Presently, skilled professionals are highly demanded in the Dairy Technology industry”. Due to increasing demand of the milk and milk based products in the country and rapid expansion of dairy industries has created huge opportunities for the skilled professionals in this industry. After the completion of the 4 year degree course the student can work in a company or he can go for postgraduate programme. Besides job opportunities, you can also start your own business such as small-scale milk plants, ice cream units, creamery and many others. “In terms of salary packages, the Dairy Technology professional receives a good package in both public and private sectors”. The salary in this field varies from company to company in which an individual is working. The starting salary for a fresher in this field could be Rs. 15,000 to Rs. 25,000 per month. After some experience an individual can easily go up to Rs. 40,000 to Rs. 60,000 per month. For any other queries regarding Career in Dairy Technology, feel free to leave your comments below. Can i get admission for dairy technology through cet exam?? i am studying 12th with PCB subject and i am interested for for dairy farming. can i take admission in bsc dairy farming with PCB subjects ? Sir I had completed my 12th with 95%.in emcet ap I got 66655 rank. Can I get the seat in svvu (or) Iwant attented to any exam. who can take Dairy Technology course?–PCB And PCM both? More chances for PCM but some of the universities offer PCB also. Through this exam you can get admission. I want take admission to dairy technology.. Which entrance exam I give ?? Sir….my name is guruprasad i pass in 12 std cbse college my course……pcbc…..Can i vaild….i have more interest in dairy farming course……..please sir suggest me…..
yes there is Entrance for this course. I have passed class 10. I want to make my career in DDT. Diploma in dairy technology. Is there any entrance and from where I can apply for entrance. Go through our article we have mentioned the career & salary prospective in our article. sir, I want to job. DDT diploma in dairy technology. I m Electrical engineer, pass out in 2014 but I wish to get knowledge of food or dairy technology. How should I get admission for that? i want to do bsc . . In . Dairy technology.